mwe3: Can you tell the readers where you live now and what you like best about it and where youre from originally? Mark Domizio: I live in New Orleans. I moved here from Philadelphia in 1997 for the music and fell in love with the small town feel of the city, along with the music and food and never left. 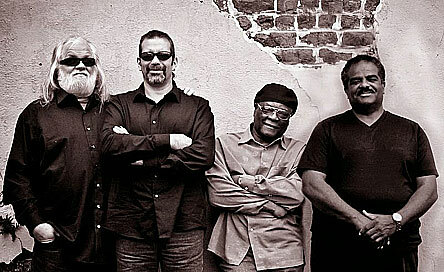 mwe3: Is your band Fo Reel a modern day blues rock supergroup of sorts? How did the band come together and evolve and when did the Heavy Water CD take shape, when was the music written and how did you come up with the title Heavy Water? Mark Domizio: Were not a supergroup, just seasoned musicians having a good time. While I was working on a solo project with David Hyde, Johnny Neel and C.P. Love, I began talking to C.P. about forming a band. We talked to Johnny and he said he was in, then C.P. came up with the name Fo Reel the next day. Heavy Water is about musicians and alcohol, which is what heavy water is and why the bear is drinking a shot on the CD cover. 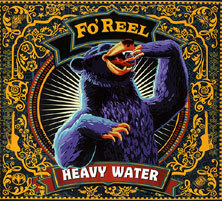 mwe3: Whats the chemistry like between the band members of Fo Reel and what did the musicians bring to the table for the making of the Heavy Water CD? Mark Domizio: The chemistry between the band members is great. We have a lot of fun and everybody is very creative, we have a family feel. When the CD was recorded everyone had creative freedom and they really put their soul into it. What you hear on the CD is great musicians having fun. mwe3: Can you tell us when you started playing guitar and what guitars are you featuring on the Fo Reel CD? What amps and other special effects do you like to season your guitar playing with? Mark Domizio: I was about 14 when I began playing guitar. On the CD I used a new Gibson Firebird with Lollar pickups on most songs and a Flying V on the rest. I used a PRS Amp on everything, other than Just Ss I Am. We used a Super Reverb that David Farrell had from Black Top Records. mwe3: On the Fo Reel CD you also include a couple of cool instrumental tracks. How do you balance the vocal side of the band with the instrumental cuts and what do you like best about both genres? Mark Domizio: The instrumentals are a chance for the band to stretch out and a great way to start the show. Then, Im ready for the vocals, thats when the show goes to another level. mwe3: Who were some of your big music and guitar heroes growing up and what artists today do you feel are breaking new ground for blues and blues-rock? Mark Domizio: Growing up; Johnny Winter, Jeff Beck, Buddy Guy, Son Seals, Albert Collins and Miles Davis. Breaking new ground; Derek Trucks and Robben Ford. mwe3: What plans do you have for Fo Reel in 2014 and into 2015? Are you planning more concerts, music writing and recording in the near future? When can we expect a new Fo Reel album in the future? Mark Domizio: We plan on touring 2015 and working on a new CD late in the year.